The instance A Joosr Guide to ... 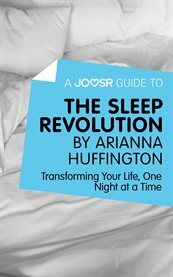 The Sleep Revolution by Arianna Huffington: : Transforming Your Life, One Night at a Time, (electronic resource) represents a material embodiment of a distinct intellectual or artistic creation found in Kent District Library. This resource is a combination of several types including: Instance, Electronic.